Thanks for the positive thoughts Tomas. I was indeed able to secure two of the signed editions of UTD after the New York book signing. The event was amazing, but condition of the signed books disappointing. I arrived early 5pm to get in line. Already 50 or so people there and the doors to the TimeCenter were scheduled to open at 6pm. Once inside we were threaded through the usual maze of ropes while tickets were torn and we waited on news of how the lottery would be conducted. A very nice gentlemen brought forward a small box of playing cards. Face down and announced we would each draw from the stack, those with a face card would be able to purchase a signed book, those blank cards would not. There were 375 cards total, 250 face cards. Those that drew blank cards were later instructed to wait until after all books were purchased by those with face cards... and if there were still books available, the organizers would figure it out at that point. I received a face card ( 7 of Hearts), my friend received a blank card, which someone in line offered him immediately two dollars for it. The man got a glare from me instead of the card. Eventually, the doors opened to the event and we found ourselves in seats on the sixth row, center stage. 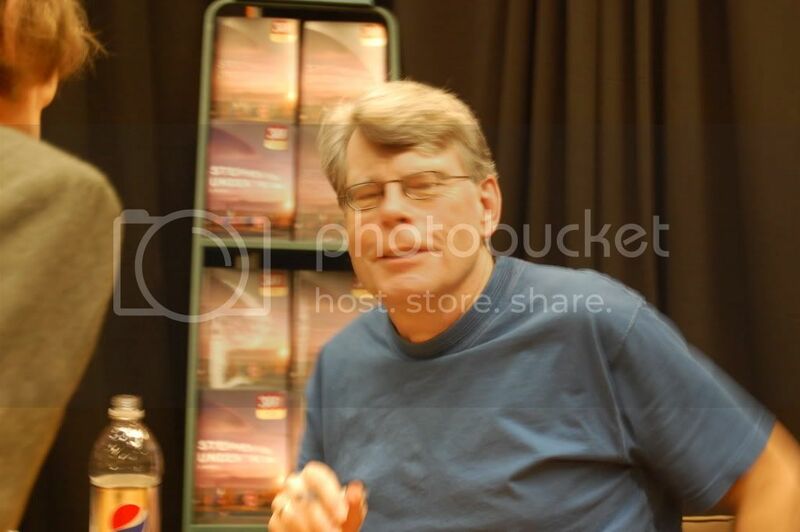 I will not even try to express how much I enjoyed the interview (my first time ever seeing King in person), but my friend that accompanied me ( not a fan or really even a reader) was moved enough to want to read UTD. Back out into the lobby, back though the maze to redeem my face card for a copy of UTD. They did collect the cards, tried to get them to let us keep it, but I guess they were afraid we would slip back in line again. Book in hand we waited to see if my friend would also get a copy. Eventually it was determined there were enough books for the second change people to each receive a copy without another lottery drawing. And, my friend did get to keep the blank playing card. Happy we headed back to the hotel to look at our books, only to find upon review one had damage to a corner at the spine. (Something I see had happened to the shipped copies as well.) The cloth is wrinkled on the spine corner and the dust jacket has a small tear where it was bumped. Both book covers have additional creases on the edges of dust jackets. Upset, it was my copy that was bumped, we raced back four blocks to the TimesCenter only to find the Boarders representatives that had provided the books packing their vehicle to leave. Out of breath, I explained that my book appeared to have been damaged in shipment and asked if they had an extras I could trade for. The female of the group stated that a number of the books that were distributed showed damage from shipment (WTF?!!!) and that there were no books left and nothing to be done. Not exactly what I wanted to hear, but I didn't really think they would be able to replace my bumped book, but I would have kicked myself later if I had not tried for a substitute. In the end, my friend gave me his copy and blank face playing card. For those attending other signings, I would suggest taking the cover completely off and inspecting the book at the event itself. Don't just check the four corner while in the bag like I did. And good luck to you as well. A question, is it cheating if I go and purchase trade copies from a local book store and trade out the damaged ones on my signed copies? Or are there codes or something that will later detract from the value of the book, I do this? Thanks for reading my story and all responses will be much appreciated. P.S. My Limited Edition of UTD was stilling on my door step outside ( thank God it had not rained) when I arrived home. It look like my cover on that one is wrinkled too, but my book and signature show no damage. I am so so so happy to now be the proud owner of a signed SK book!!!! Still in shock really. I had a great time in Atlanta and loved meeting so many people on all the boards. Skinglover, it was great to meet you. I am very glad to hear you got a book Andrea, no problem with swiching out the DJ, the books that were signed should be the trade edition and any of the covers will work for it. I go a special treat in Atlanta, Bev Vincent was there along with David and Leanne (sp?) 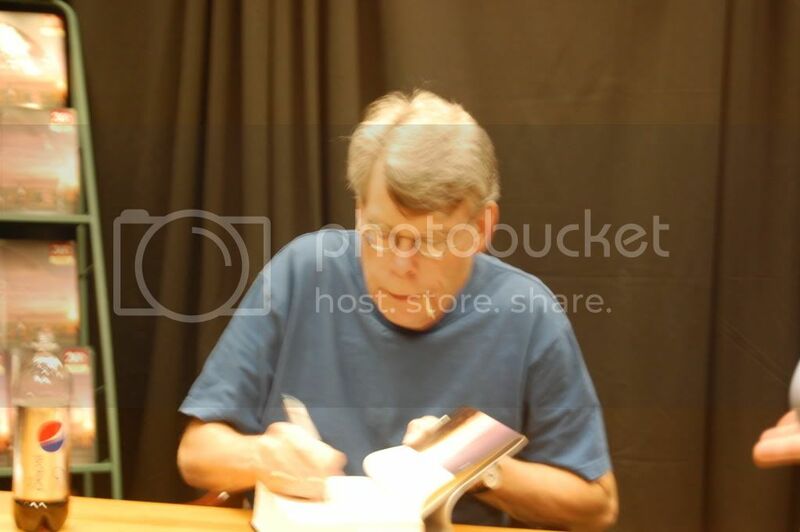 from the overlook book store and I was able to get a copy of Stephen King Illistrated Companion and Bev signed it for me. That was really nice of him. Will post the somewhat amusing story of how I tracked him down while there tomorrow. Will also try to figure out how to put pics in posts and post the few I did get here then also. Hey Christine it was great to meet you also. My husband actually got in and got another copy and THEN, I got to go back and get ANOTHER copy (to give as a Christmas gift). I got a couple of great pics when going in the second time and will post them tomorrow. Stephen really seems like a great guy, glad I got the chance to finally meet him! We ended up going to Gatlinburg and Pigeon Forge on the way back home. I actually saw a bear while driving through the mountains and got pics of him also. What a weekend!!! Thank you for that awesomely detailed post on your evening, I'm glad you had a good time! After all (ideally) the event should be just as much fun as getting the book itself. Yep you're fine swapping out the DJ's they're regular 1st editions so the DJ's will match. You might want to make sure to get the same kind (white vs grey lettering) just to keep it absolutely the same.... Assuming they were only handing out one specific color of DJ that evening. Interesting that it appears all the copies in the display in back of King seem to have the white lettering. Did you see any with the dirty grey? Great pictures skinglover! I wish I could have been there! That guy looks just like the guy in the movie CREEPSHOW! Strange! 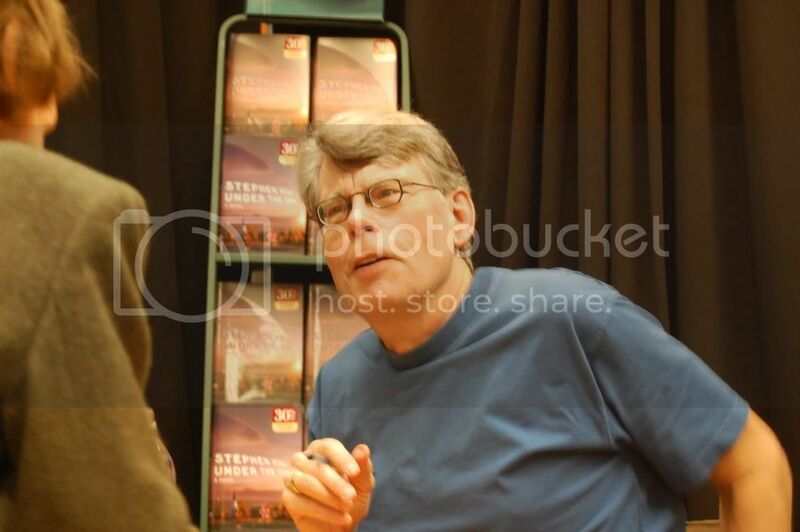 Saw Stephen King tonight in St. Paul. I was one of the lucky ones to have my name drawn to purchase a signed copy. Not only that, but it looked like ALL of the copies of the book they had were the dirty grey lettering. My set is complete!!! Awsome, thanks for sharing! Did they allow cameras or were you sneaking those shots? They sold both the gray and the white lettering books at the store...your choice. A lady in front of me got a book that was totally bound upside down. She thought the cover was on upside down, but looked at the book spine and it was the pages were inserted upside down! That will be a collectible! They DID allow cameras, but no flashes. The lighting was great, though. The first time going through (I went 2 times) the guards were very rude acting and rushing people. The second time, they relaxed and let you get a decent picture.